Beautiful, family friendly, one of a kind experience staying in the Presidential Suites of Green Valley. These suites have their own private courtyards with hot tubs, BBQs, lounge chairs and covered patios. Each suite comes with two identical master bedrooms, each with their own fireplace in the bedrooms and Roman tubs in the master bathrooms. In each suite, the 3rd bedroom comes with a queen size Murphy bed which stores away against the wall during the day while the room becomes a private exercise facility with stationary bike, free weights and an infrared Sauna built in. With an oversize, state of the art kitchen, large dining and living area with large screen TV and over 3500 sq ft of indoor and outdoor living space, these suites truly are luxury fit for royalty. Beautiful, family friendly, 1 bedroom condos, Most units have been recently updated with new flooring and appliances. All come with new flat screen TVs and most have Washer/Dryer in unit. All units come with views to die for, whether the patios/balconies overlook the Green Valley pools, or the mountains of Snow Canyon, you can rest assured you will be able to relax and enjoy your stay with us. All units come with access to Las Palmas and Green Valley pools and facilities. WiFi and cable TV included in all units. Beautiful, family friendly, 2 bedroom condos, Most units have been recently updated with new flooring and appliances. All come with new flat screen TVs and all have Washer/Dryer in unit. 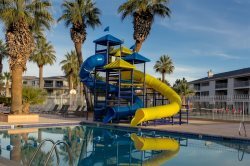 All units come with views to die for, whether the patios/balconies overlook the Las Palmas or Green Valley pools, or the mountains of Snow Canyon, you can rest assured you will be able to relax and enjoy your stay with us. All units come with access to Las Palmas and Green Valley pools and facilities. WiFi and cable TV included in all units. Beautiful, family friendly, 3 bedroom condos, Most units have been recently updated with new flooring and appliances. All come with new flat screen TVs and all have Washer/Dryer in unit. All units come with views to die for, whether the patios/balconies overlook the Las Palmas or Green Valley pools, or the mountains of Snow Canyon to the north, or Beaver Dam mountains to the south and west, you can rest assured you will be able to relax and enjoy your stay with us. All units come with access to Las Palmas and Green Valley pools and facilities. WiFi and cable TV included in all units. Beautiful, family friendly cabin in the mountains only 45 minute drive from downtown St. George. Get away from the heat and traffic and treat yourself to one of the most beautiful places on earth. This 3 bedroom 2 bathroom cabin has everything you need with large grass areas for games, horseshoe pit, fire pit, tall mature trees for added shade, and views to die for. Relax on the porch-swing and watch as wild deer and turkeys wander through the yard. The cabin features an updated kitchen with granite counter tops, master bedroom with its own TV and sitting area, living room with large screen TV, bunk beds for the kids, and free WiFi. Pine Valley is surrounded by hiking, biking, horse, and ATV trails, as well as Pine Valley State Park with a creek and fishing pond. Accepting bookings now! Near Denali National Park located in Talkeetna, Alaska. We have a 2 bedroom chalet being loaded with furniture and will be ready beginning May 1st. This beautiful chalet will sleep 8 and is a new construction home with custom woodwork and attention to detail in every corner of this fun and exciting chalet. Talkeetna has quickly become a destination vacation of choice for those who have visiting Alaskas untouched beauty on their bucket list. With countless miles of hiking and biking trails, fishing, hunting, river excursions, flights around Mt. Mckinley in Denali National Park, and so much more offered in this relaxed setting of a small Alaska town surrounded by natures finest work. You will not be disappointed adding this chalet to your vacation must do list! Beautiful, family friendly, Estancia Resort offers a new construction, 3 & 4 bedroom 3 & 4 bathroom condos in Green Valley.